Castel Roncolo. Photo courtesy Topcastles, Creative Commons license. 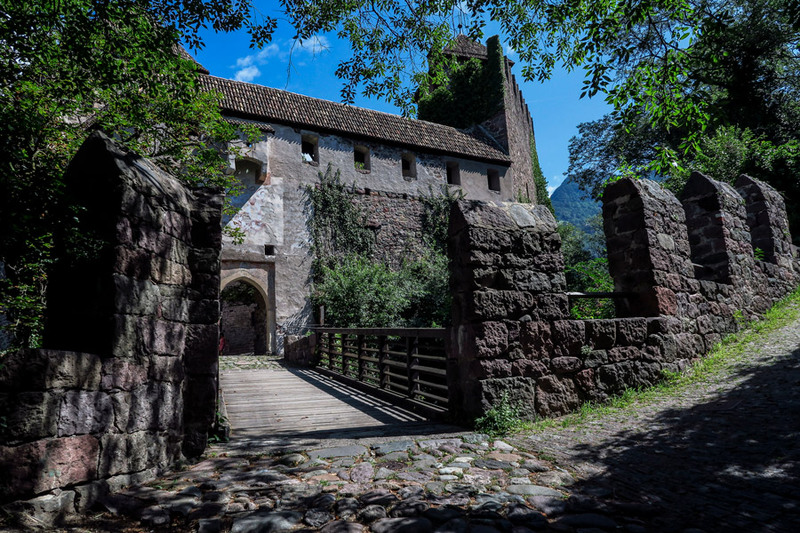 The first indication of any cultural rift in South Tyrol came when Andrea and I headed out on foot from the lovely Park Hotel Laurin in Bolzano and went north along the Talvera River to see Castel Roncolo. 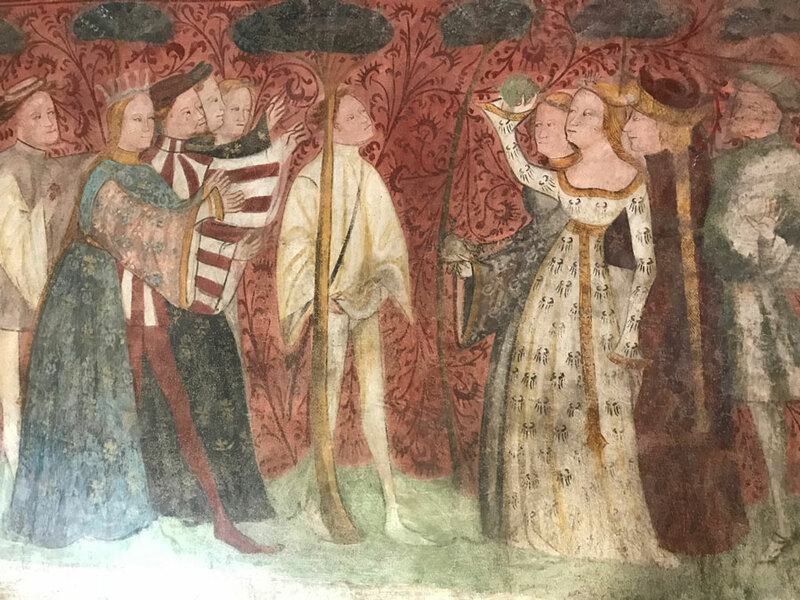 The 13th century castle is known for a long and convoluted history and whole rooms devoted to frescoes, called the greatest cycle of medieval frescoes still preserved. We were standing on the sidewalk of a narrow and steeply sloped street with no castle in view. We were probably an interesting sight for locals, two lost tourists wondering what went wrong with our trusted navigation guide. A woman riding a bicycle came along. She wore an ankle length dress, her hair was steel grey, and her bicycle was older and single speed—no fancy gearing for her. “Excuse me, can you tell me where is Castel Roncolo?” I pointed out the picture of the castle and its name in a guide book. She peered at the page in the book, shook her head and gave me a puzzled look. “Oh, nien. No Roncolo. Schloss Runkelstein!” She pointed down the street to our left then made a counter clockwise motion with her right hand. “Gehe hinunter, und links, und…” She paused looking for the right word. “So down there,” I said in English and making the same semi-circle with my hand that she had and then pointed up another street. “Ja, ja,” she said smiling that I seemed to understand, but then her face became very grave and serious. 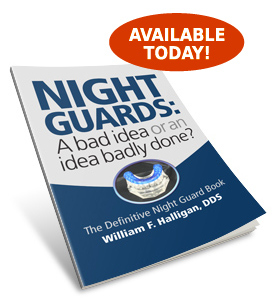 She gesticulated sharply with an index finger. “No Roncolo! It is Schloss Runkelstein!” Not exactly angry but quite strident, she left no doubt about that other name. And she took off on her bike. 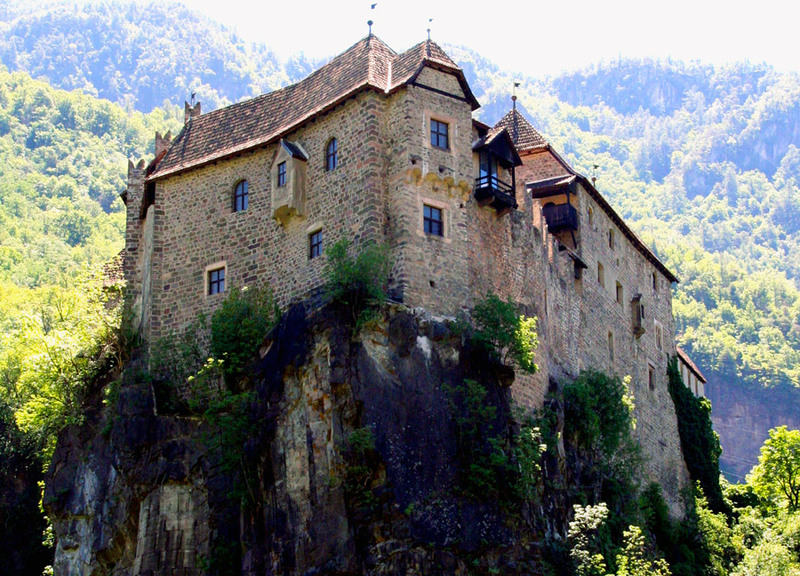 Castel Roncolo, AKA Schloss Runkelstein. Photo courtesy Missusdoubleyou, Creative Commons license. One of the many frescoes in Runkelstein castle. And it turns out that the castle was indeed Schloss Runkelstein for centuries and for those who speak Italian it became Roncolo much later. And the city of Bozen became Bolzano. The resort town St. Ulrich became Ortistei. A confusing part of the world here in the north of Italy where close to 75% of the population speaks German and every city, town and valley has two names, or sometimes three. 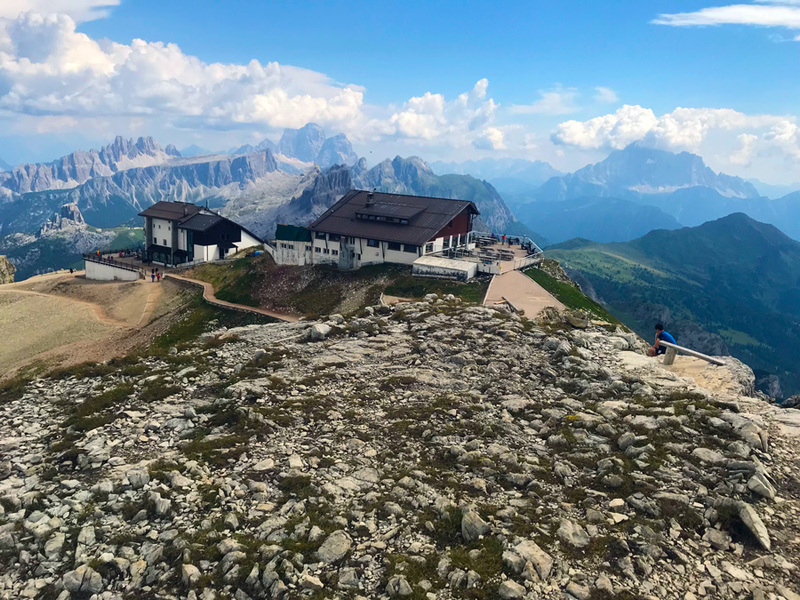 Some days later, a few miles past San Cassiano, we turned left at Capanna Alpina and headed up a mountain trail toward the Refugio Lagazuoi where we would spend the night. It was not until we were close to the top, near the mountain hut, that we could see the remnants of the Great War, the war that resulted in part of Austria—at that time Austria-Hungary—being annexed by Italy, and nearly 60 years of turmoil, that, while seemingly quiet and peaceful today, still roils in some Tyrolean hearts. 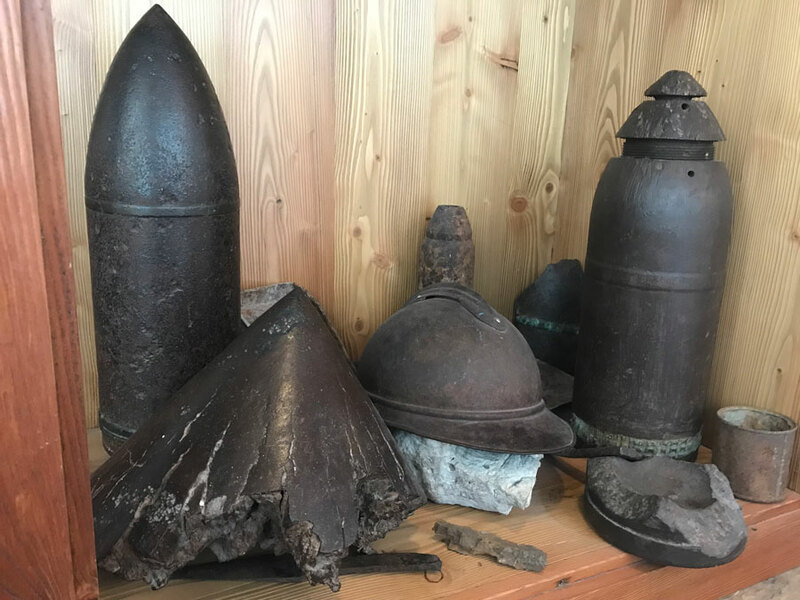 WWI munitions found on or around Mt. Lagazuoi. Trenches and Italian flag at sunset, near Mt. Lagazuoi. Trenches dot the hillside today, and tunnels, and balustrades all built by the Austrians to prevent the Italians from taking these mountains. 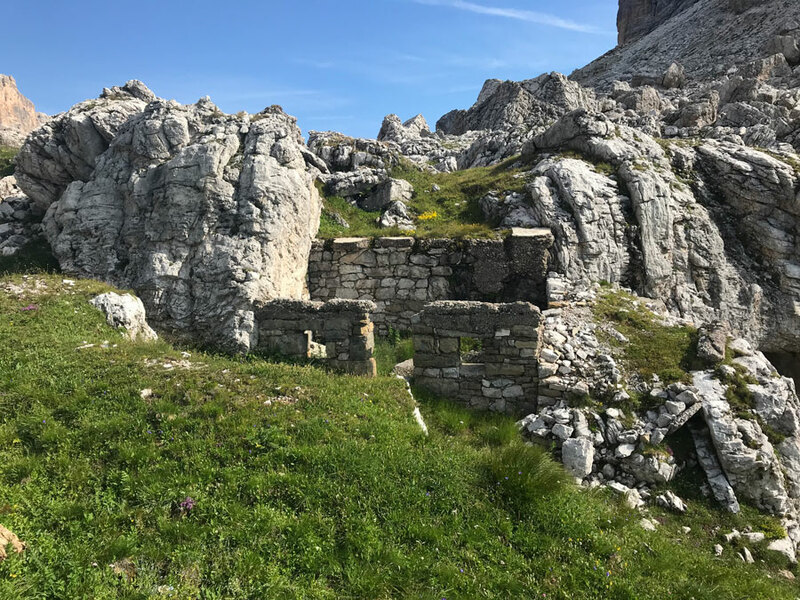 Soldiers fought for years here, largely to stalemate, the Austrians trying and failing to beat back the advance of Italian troops, and Italian soldiers failing to take the defensive positions high on the mountain. The mountainsides are so steep here, the winters so harsh, that hundreds of men on both sides of the conflict were killed, not in battle but in avalanches. Caves and tunnels, dug into the hard carbonate rock—composed of the mineral dolomite from which these mountains get their name—sheltered the Austrians and undermined Italian positions. In our school days we learned that the Great War began with the assassination of Archduke Franz Ferdinand on June 28, 1914. But with a further reading of history it becomes apparent that the reasons ran much deeper and that the prospects for war were in place far earlier. One historian has even stated that by late July, 1914, the assassination of the Archduke was hardly more than a side note. And Italy, though officially part of the Triple Alliance—Germany, Austria-Hungary, Italy—declared itself neutral. Prime Minister Antonio Salandro stated that the treaty was for defensive purposes and that because Austria-Hungary was the aggressor, the treaty did not stand. Historians might quibble on that point as Serbia was clearly a violent aggressor as well. Germany tried to get Italy on its side, to no avail. But in a secret meeting in London, on April 26, 1915, Italy was promised a great deal of territory, including southern Austria, if it would join the Triple Entente of Russia, France, and Great Britain—assuming an Allied victory. It was an offer the Italian Foreign Minister, Sidney Sonnino, did not refuse. And so, in 1918, at the end of the war, South Tyrol became a part of Italy. During the 1920s there was intense Italianization of the area with names changed from German to Italian. For a time, under Mussolini, the German language was even outlawed. Decades of unrest followed. Progress toward the present status of the region was slow, but in 1972 South Tyrol became a semi-autonomous area within Italy’s borders, able to make largely independent decisions, including the decision to pay only about 10% of normal taxes to Italy’s central government in Rome. Today, South Tyrol is the most prosperous region in Italy, and one of the most prosperous in all of Europe. Still there are people, like the steel haired lady on the bicycle in Bolzano—she would say Bozen– who are unhappy. Polling data is varied and perhaps less than trustworthy. But depending on exact locale, as many as 61% of the people of South Tyrol would favor either secession from Italy or reunification with Austria. South Tyrol though is held up as an example of how these cultural differences can be approached. Many parents in the region do the “linguistic slalom,” sending their children to a German middle school then switching to an Italian high school. 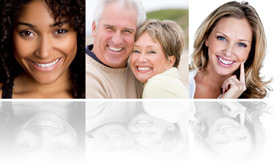 Young people seem comfortable being with friends who speak either language. Despite what appears to be a clash of cultures, South Tyrol does thrive and I suspect will continue to do so. 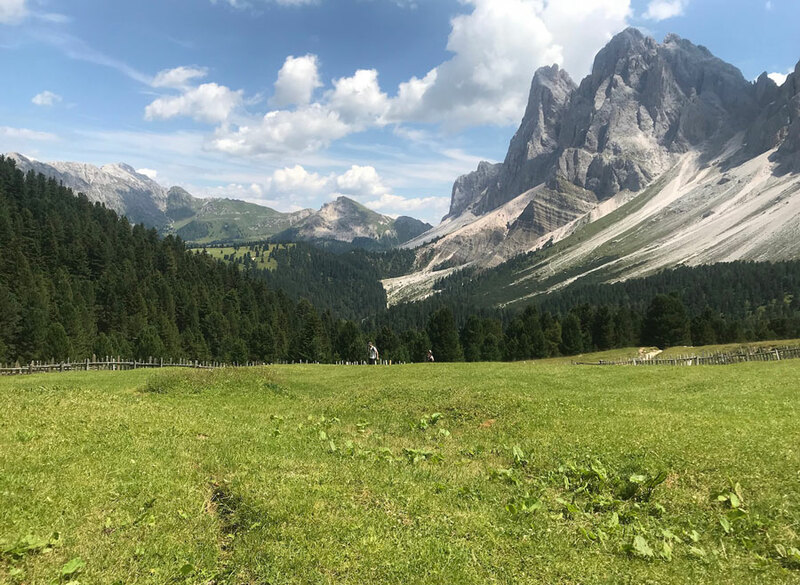 Meadows and mountains: The Dolomites. 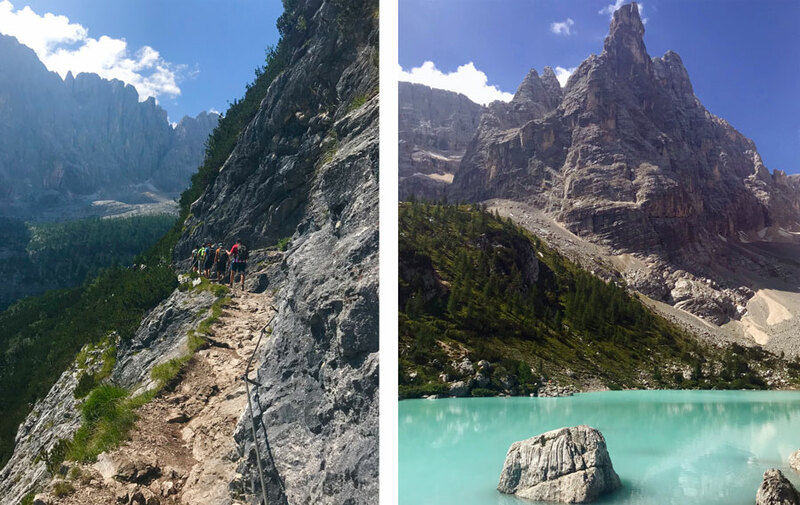 Left: Hiking in the Dolomites. Right: Lake Sorapis, near Cortina, Italy. 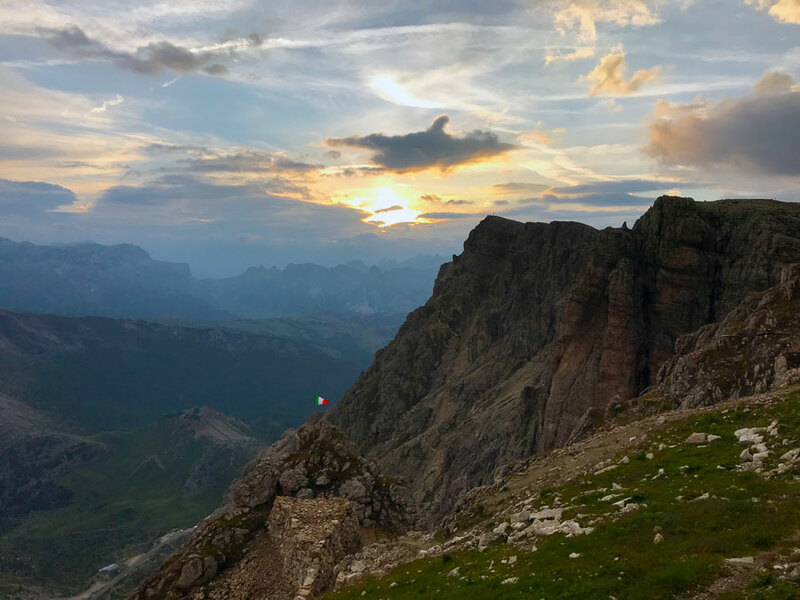 After one night at the Refugio Lagazuoi (bunk beds, a rickety ladder, and a very tiny room) Andrea and I hiked down the other side of the mountain toward Cortina. When close, we caught a cab for a ride into the city. The driver spoke good English as well as German, Italian, and his own mother tongue, Ladin, an ancient language spoken by about 4% of the people in Tyrol. I tried to get a local’s take. “We pay plenty of taxes!” Obviously, a sore subject. That interview over, we switched to discussing cars. He was happy to talk about cars. His “cab” is a late model Mercedes. “Seems nobody here drives an old car, or a car in need of body work, or even a dirty car. Everywhere I go I see new Mercedes, BMWs, or Audis,” I told him. “Of course,” he said. “Why would anybody drive an old car?” His tone seemed to say, Naturally. Obviously. I did wonder though, what happens to all the older cars in Tyrol? Maybe shipped off to Rome? Despite some indications of disillusionment, the model of a semi-autonomous region within a country has garnered praise. It is held up as a possible model for the separatists in Catalonia who would favor breaking free from the rest of Spain. It has been suggested as a solution for the Basques. Recently, the Dali Lama visited South Tyrol to meet with local officials and investigate how this model of autonomy was achieved and to carry that idea forward in Tibet—to perhaps loosen the grip of China on that conquered territory. Meanwhile, is our taxi driver correct in fearing the possible role of a flawed Italian government in lives of those in South Tyrol? He seems to echo warnings you can also hear from Eva Klotz. Italy’s weakness could carry over into South Tyrol. “South Tyrol is not Italy,” she says. Yet if friends ask where we’ve been lately, we say, “Northern Italy.” It seems like a true and simple statement. 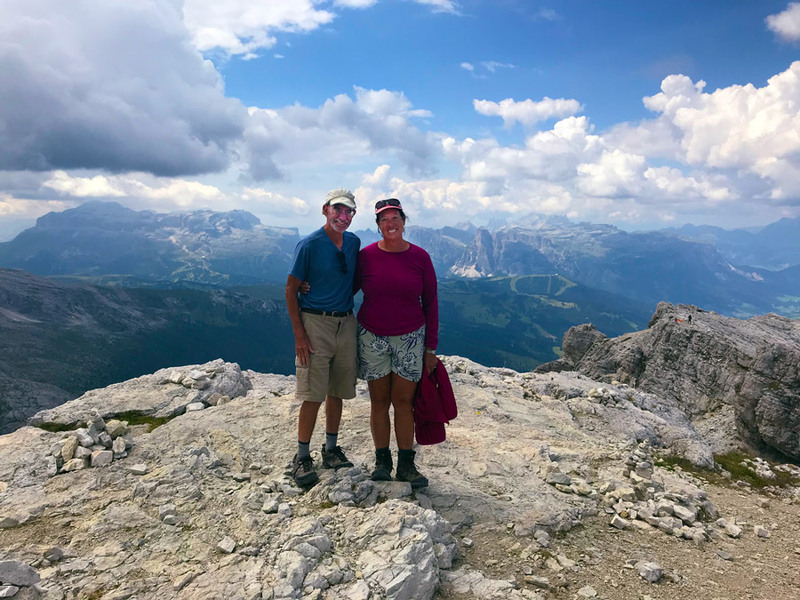 William and Andrea Halligan, somewhere in the Dolomites. You are a great travel guide.